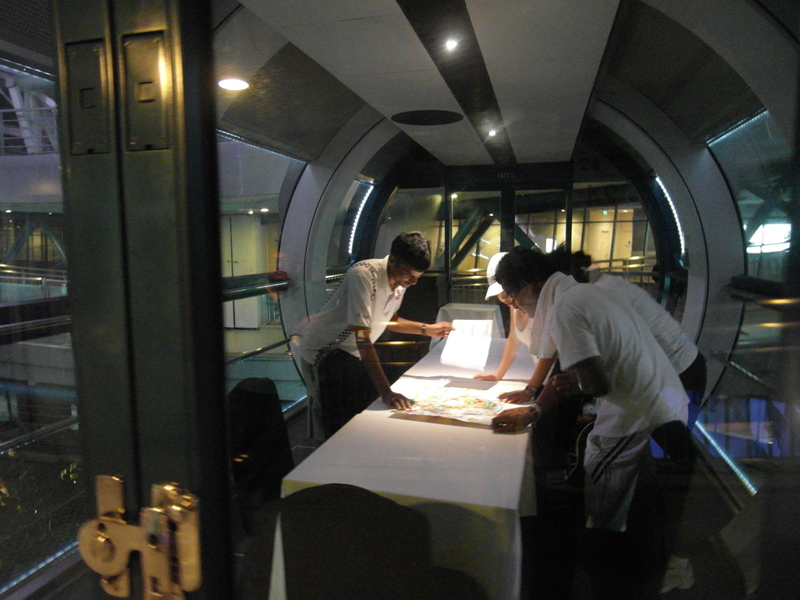 With blessings from the management of the Singapore Flyer, special arrangement was made for us to organize our staff bonding activity after the operating hours at the World’s Largest Observation Wheel. Eight teams of four shall compete to win the top prize. The first team to arrive at the final check point will walk away with cash prize of $400. Fitting into the theme of racing after dusk, we came up with the team name “Full Moon” to represent us. 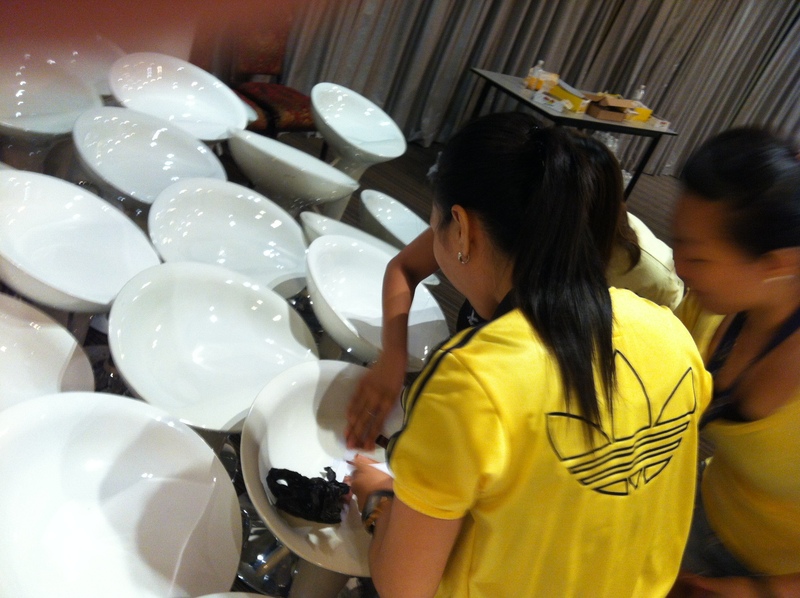 Our team dressed up in yellow to show our enthusiasm for the event. 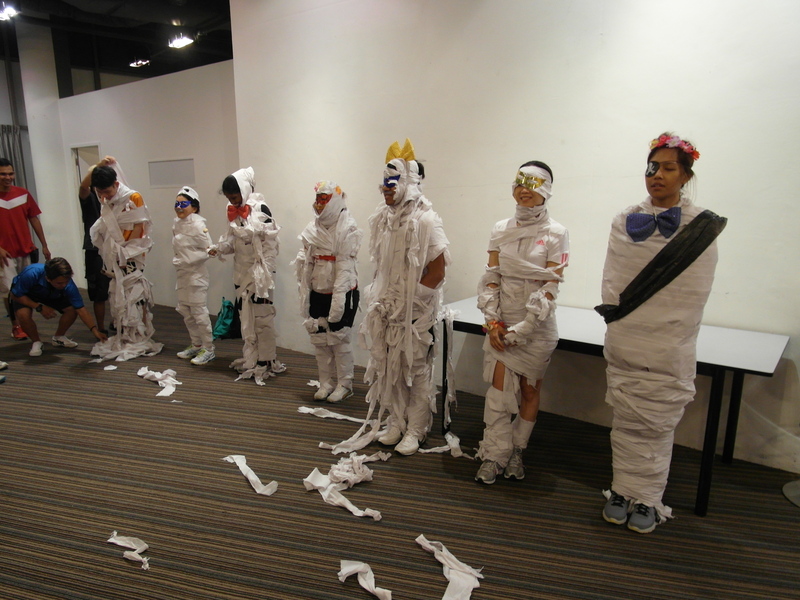 To foster bonding and for the teams to get to know other colleagues better, we kicked start with two telematch style games – “Find the Colour” and “Mr Quek Quek”. Packets of M&M mini chocolates filled up a large glass bowl. Teams were to use a pair of disposable chopsticks to pick up a particular colour M&M chocolate, passed down to the next member until the chocolate was safely dropped into the bowl at the back of the room. Mr Quek Quek is a game of untangling. The teams were combined to form two big groups. Group mates cross-hand creating a giant human ball and the appointed leader was to untangle the group at the fastest time. Lady Luck was on our side, with a few smart tricks, we won both games and were rewarded with two rolls of toilet paper (which was revealed to us later on the purpose of the toilet rolls). We were given our first clue in the form of a jigsaw puzzle, which was pieced together to show the photo of one of our colleagues. We ran along the different levels of the corridor before realizing that there was an additional clue at the bottom of the paper. Upon our enlightenment, we raced to the entrance of the Journey of Dreams to received our second clue. The second clue brought us into the capsules. We were told that the next clues were placed randomly inside the capsules and we had to choose a cabin and hunt for the correct map in order to locate our next check in point. We suffered badly at this station. Most teams managed to retrieve the clue after entering the second capsule but we had to enter into three different capsules in order to find the correct clue. Boo! Behind half an hour behind rest of the teams, we tried our best at the game station behind Singapore Food Trail to catch up on the lost time. We found the next clue behind the elevator door instructing us to proceed to the Sky Deck. Unfortunately, another team had removed the instruction sheet and we almost got into an argument with the organizers over the clue. Finally, we were told to snap a photo in order to receive over next clue. At the car park, we found the cash card top up machine with the clue underneath it. Running back to terminal building of Singapore Flyer, we had to entertain the station master with a pole dance in order to receive the next clue – a cup of Koi bubble tea. We figured out the clue was pointing to the koi pond and true enough, we found strings with envelope hanging there. Finally, we had to carry our wrapped friend up to Bay View Room at level 2 to complete the race. Despite our diligence, we walked home with a consolation prize. But we were awarded with lots of laughter and fun to nest our weary souls. 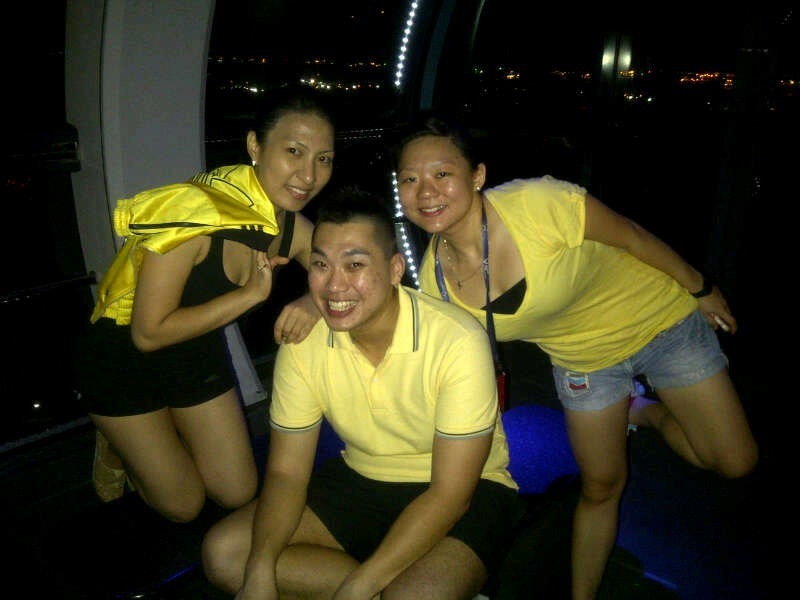 This entry was posted in Events, Singapore and tagged amazing race, full moon, fun, game, race, singapore flyer, teambuilding. Bookmark the permalink.